3.5 months in..... Growth is coming!! Week 4 is the final end picture which as you will notice is starting to shed.... This is have seen referred to as 'the ugly duckling phase'. Fingers crossed, I will be through and seeing some growth in a few months ! Sorry I should have finished off by saying those of you that want to know when shedding really accelerates it's definitely been week 4 for me. I will post more pics shortly so you can see how it's progressing. Still very happy with the procedure from Dr Feriduni and his team and everything that's happening is what was described. 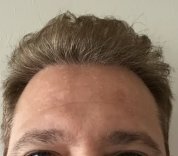 , Ok so after 5 years of researching I finally took the plunge and pushed ahead with an FUE procedure. As a thirty something I felt I had waited long enough and now was the right time. I'm writing this blog around what I experienced; everything from travelling to the actual procedure and recovery, as I found that everywhere I turned on the internet there was so much information and it genuinely did take me about 2 years to dissect the - who (surgeon), what (type of procedure) where (UK or abroad). I hope that by writing this others will be propelled forward in their research and not have to spend as long as I did procrastinating. So here goes...... Who - Dr Feriduni - why? This was easy as I have literally spent more hours than I care to imagine researching reputable, proven surgeons and this man seemed not just a surgeon but an artist with the way in which he designs hairlines. If you look across the web there are quite a few really great reviews however, not as many recent pictures for Feriduni. I have seen many posts asking why there aren't more 2016/2017 pictures. That reason is clear once you actually go to the clinic...It's booked up 6 months solid so they don't need to advertise and really push their online presence. I can assure you many procedures are being carried out day in day out. I can honestly say I could not wish to meet a more genuine Doctor and from the minute I saw him all of the above was confirmed, his absolute focus is upon his patient and getting the right outcome was evident and paramount. What? - FUE all the way for me; I have looked at the post scarring for FUT and whilst it's just my personal opinion it looked like it would take a long time to heal and patients are out of action for quite some time. As I only wanted circa 2,000 grafts I felt this could be reasonably done using FUE. Having had the procedure now I do think that the strip method could be a little more restrictive in terms of the amount of post op rest/healing given the stitches and staples. Where? - I truly believe this is the last thing you should be asking yourself. Whilst convenience is often how many people think, for me I didn't care and knew I would have to travel for a quality surgeon. I should have mentioned earlier I live in Central London, UK so it would have been so much easier to go to Harley street. I did look into Farjo who is held up as possibly one of the best in U.K. however, a few pictures and comments referred to his results being a little sparse so that put me off a little. My decision on where to go was driven by the first point of who. When I researched further into Doctor Feriduni I could see he was based in Hasselt, Belgium which I had never heard of (now I've been I can say it's an amazing place!!) but if that's where the surgeon was I knew that's where I was going. Day -1 (day before op) I arrived into Hasselt at 2pm, it's a fairly straight forward journey from Brussels Midi (the main station) and takes around an hour 15min and costs €10. After getting into the station I then walked into the centre of Hasselt (there are lots of nice shops and restaurants) to try and find my hotel. I had chosen to stay at the Hassotel as given many patients feedback i read on Dr Feriduni's website I thought it was worth giving it a try. From the moment I walked into the hotel I was amazed as the discount you get for being a Feriduni Patient but also how used to seeing hair transplant patients they are. When I explained I would need a taxi for a pre-op consultation at 430pm to Feriduni I expect a look or a couple of questions.... Not a thing, it's like it must be so commonplace for them now. Anyway after being checked in and going to my lovely room it was time to head for my pre-op consultation. I have to say given it was 430pm I thought at best I would get 15min of the Dr's time - how wrong could I be; we were still sat discussing at 5.25pm!! I wanted to reflect on the hairline design so he marked it all up, gave me a bandana and said to go away in my own time that evening and reflect on it and any changes could be made the following day. Day 0 (The operation) After a light breakfast I was picked up by a car organised by the clinic at around 7.50am. I had a strange mix of excitement and nervousness, the latter was offset somewhat by having met the Doctor and his staff the night before. On arrival I was shown to my patient room which was kitted out with a lovely sofa and TV to leave all of my belongings. Then the doctor came in to make sure everything was ok and go over any changes I wanted to make (there wasn't any so that was easy). I was then taken to the operating room and was blown away by a) how state of the art it was b) how relaxed and lovely the whole team were. THE OPERATION For FUE they ask you to lie down face down whilst anaesthetic is injected into the back of your scalp. They use a machine which vibrates and it felt like a few little scratches....Honestly less than going to the dentists! Then after 5-10 minutes the extractions then start. This seemed to take a little while (although maybe only 2 hours) mainly because there isn't much to do or look at when you're face down, it's actually quite a surreal sensation as you can feel a small tug on the back of your head with each extraction but absolutely no pain. After 2 hours the more relaxing bit started; I was able to turn over and sit up to choose a film and was given some chocolates. The doctor then put more anaesthetic into the top of the scalp in readiness for the incisions to be made for the grafts. I think for the doctor to make all the incisions it took around 90minutes. After a few more chocolates the technicians came back into the room and started implanting the grafts into the incisions the doctor had made. It was amazing for Dr Feriduni to chat me through why he was making certain incisions at certain angles and how it would create a more natural outcome. HOME STRAIGHT..... The last part of the day was the grafts being placed and this flew over after watching a couple of films. The only mildly uncomfortable element was the pillow given to keep you propped up, after a couple of hours it can (like anything) make you a bit stiff in the neck. If that's all I can possibly complain about you can see how amazing this clinic and staff truly are! Point to note - the Dr decided he wanted a few extra grafts in to give more volume so towards the end the technicians had to extract another 90 grafts which I thought was brilliant that no matter what, the design, look and outcome is put first! ALL OVER - after the technicians were finished it was back to my patient room for a lovely sandwich and fruit bowl before being checked over by the doctor. He said everything had went very well and he was really pleased with the op. I did 'bleed quite a lot' however, I was told this is a benefit to the healing process I don't know why but given how long I had been operated upon I was nervous about my first night at the hotel. This was appeased massively when the doctor and head nurse gave me their phone numbers and said to call anytime if there was even a slight issue. Thankfully I didn't need to as after a 600mg of ibroprofen and some room service I slept pretty well (despite having to sleep upright). Day 1 - I woke up with a sense of relief that I had finally taken the step to travel to Belgium and now was through the FUE op in recovery. I couldn't stop looking in the mirror at the new hairline which despite a little swelling I felt like it was perfect for me (and still left safely 7,500 grafts for future if they were needed). Later that morning I went to get my hair washed at the clinic around 9am and they showed me everything I needed to do with my products. The Dr gives you a top quality product set of sprays and serums to help the healing process. I actually enjoyed the hair wash and was grateful for the time and aftercare they gave me. For the journey there and back I made a bold decision not to wear the bandana. In fact since the operation not once have I worn the bandana and even went out night 1 to a lovely Belgian fries place (Fritz & Co - recommended by Cristian) and I think out of 100 people I may have had one slight look. My best advice is to go out and let the air get at your scalp to help the healing and don't worry about what it looks like. Day 2-4 I watched the mild swelling move around my forehead to my temples and gradually down my face. The tip I would give everyone is if you don't feel up to going out -don't - room service at Hassotel is incredible! Rest and sleep as much as possible. I found on a morning and night I wanted to go and get some fresh air so went out for an hour each time and even tried some nice restaurants along the way. Day 4 - Back to the UK I have to say the most nervous I felt the whole time I was in Belgium was around travelling back without wearing the bandana. Pleasingly I couldn't see one person look my way and the only slight issue which was a positive was a Turkish guy saying 'wow I can't wait to get my hair done soon'. This lead to a debate over Turkey and Europe for FUE and I certainly think he went away to do more research. I said the ones I had seen in my opinion looked a little unnatural as they were almost like a straight line. Now I know there are some brilliant Turkish surgeons so I'm not knocking them but I knew very quickly Feriduni and Europe was for me! I will post more photos as the months go on however, I wanted to share my first 4 days with you all. In summary if you are thinking about doing it - do it! Research wisely however, having gone through the process with Dr Feriduni I can only say great things - top class surgeon, amazing artistry, relentless pursuit of perfection and puts the patient first at all costs. I know the results won't be visible for many months but so far feeling good and as I say I will keep posting with updates so you can see how I progress.